The Disney Store is offering Up To 50% Off Select Back to School Gear with deals starting from ONLY $5 with Free Shipping on orders over $75 enter code SHIPMAGIC at checkout. For example the Minnie Mouse Clubhouse Lunch Tote is only $7.47 (Retail $14.95). Head over and browse around for your childs favorite Disney Character! 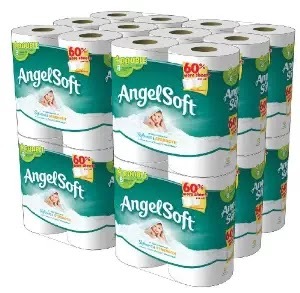 Right now you can get this Angel Soft, Double Rolls, 12-Count (Pack of 4) – 48 Double Rolls for ONLY $21.99. That makes each single roll just $0.20 each! Lowe's - Patio Furniture & Outdoor Decor Up to 50% off! One of my favorite times to shop is after season clearance sales. Right now, Lowe's has Select Patio Furniture & Outdoor Decor up to 50% off. Plus, choose Free Store Pick Up to save on shipping. I love this Adams Mfg Corp Coral Resin Stackable Adirondack Chair for only $8.99 (Retail $17.98). Sunglasses for the Whole Family Up to 60% off! Today ONLY - take Up to 60% Off Sunglasses for the Whole Family! For example these Foster Grant Men's Slick Wrap Sunglasses are $9.60 (Retail $16).